AmGuard™ safely, rapidly and efﬁciently detoxifies toxic free ammonia. It is safe to use during tank cycling and is ideal for treating emergency situations. AmGuard™ is the strongest liquid ammonia binder on the market. It works within minutes to detoxify free ammonia, and it doesn’t degrade for nearly 72 hours. That’s at least twice as long as our competitors’ products. Unlike competing products, AmGuard™ converts it into a safe, non-toxic form that is readily removed by the tank’s biofilter. It does not alter pH. Ammonia can exist in two forms: free and ionized. It is only the free form that is toxic. Traditional ammonia test kits convert all ammonia to free ammonia by raising pH to 12–14; at this pH AmGuard™ cannot function and thus a false positive reading will result. For long term ammonia control, use Seachem Stability® and Matrix™. Use Ammonia Alert® or MultiTest™ Free & Total Ammonia to directly monitor levels of free ammonia. AmGuard™ also removes chlorine and chloramines. ADVANCED: If you have an Ammonia Alert® that is reading “Alert”, then use 1 capful (5 mL) for every 400 L (100 US gallons) daily. If it reads “Alarm”, then use 1 capful for every 200 L (50 US gallons) daily. If it reads “Toxic”, then use 1 capful for every 80 L (20 US gallons) daily. EXPERT: If using our MultiTest™ Free & Total Ammonia test kit, use 1 capful (5 mL) for every 40 L (10 US gallons) to remove 1 mg/L (ppm) of free ammonia. Alternatively you may employ the following formula for a variety of ammonia and water levels: 0.125AV=m (for volume in liters) or 0.5AV=m (for volume in gallons). A=ammonia concentration in mg/L, V=the volume of water being treated and m=the volume of AmGuard™ to use in mL. For example, to remove 1 mg/L of ammonia in 100 gallons you would use 0.5*1*100=50 mL. When should I use AmGuard™ and why would I use it instead of Seachem Prime®? A: AmGuard™ is ideal for use in emergency ammonia spike situations. It will bind with ammonia for up to 72 hours and can control ammonia at higher concentrations. AmGuard™ will also remove chlorine and chloramine but Prime® has a wider range of benefits. If AmGuard™ is removing ammonia from the system, won't that starve the beneficial bacteria? A: AmGuard™ does not remove ammonia from the system. It simply binds ammonia making it harmless to the inhabitants and still bioavailable to the beneficial bacteria. Is AmGuard™ for freshwater or saltwater? 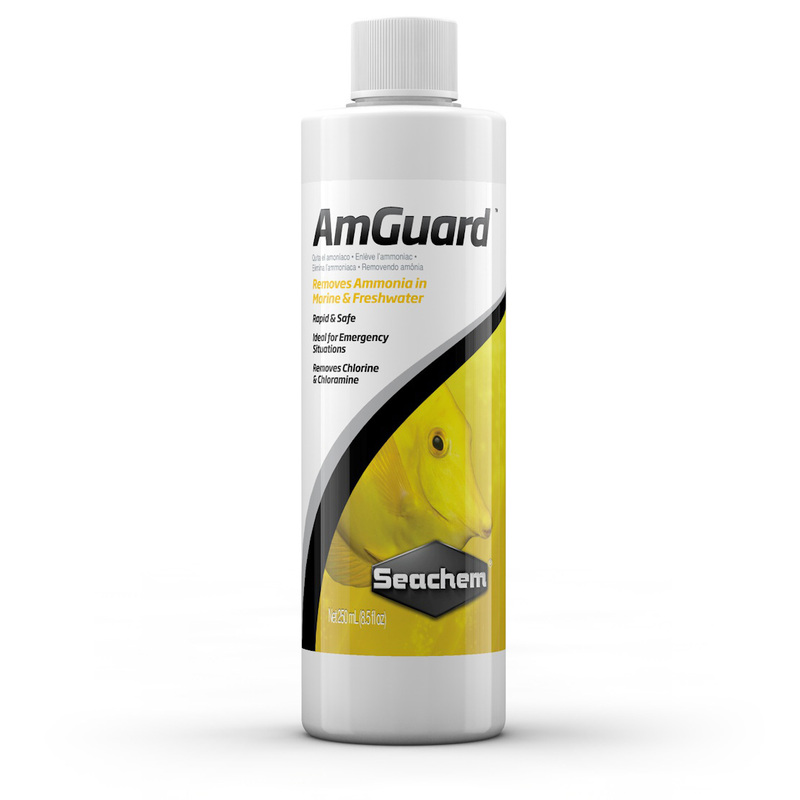 A: AmGuard™ can be used safely in both freshwater and saltwater systems. Is it possible to overdose AmGuard™? A tank with an exceptionally high bio-load, high temperature, or poor circulation is likely quite low in oxygen, so reducing the oxygen any further may be dangerous to tank inhabitants. In this case, using a half dose of Prime or increasing the oxygen content of the tank is recommended. Most conditioners that clear away chlorine and chloramine, products that detoxify ammonia and nitrite, as well as some medications will reduce oxygen levels in the tank. Will AmGuard affect my pH, KH, or GH? A: No, AmGuard™ will have no impact on the pH, KH, or GH of the typical aquarium.